I’ve always been interested in street names and where they come from especially when it’s so obviously someone’s name. There seems to be an awful lot of famous doctors in Barcelona. I’ve never known so many streets named after doctors before. Doctor Carulla, Doctor Bové, Doctor Ibáñez, Doctor Ferran. Most north of Diagonal near hospitals as one might expect. I once viewed an apartment on Carrer del Doctor Rizal. I did ask the landlord who he was but he didn’t seem to know. I think he thought it a bit strange that I’d asked. Strange if you didn’t ask I would have thought. But maybe that’s just me. Anyway, back to Enric. We all know Gaudí and Dalí and possibly a few others, but Enric Granados I hadn’t heard of. 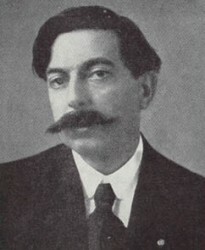 It transpires Enrique Granados y Campiña was a pianist and composer of classical music that had a uniquely Spanish style. He was also a talented painter. He lived between 1867 and 1916. So no wonder I missed him. The interesting part is that he died crossing the English Channel from England to France. Torpedoes struck the ship he was travelling on and presumably sunk it. He drowned and his body was never recovered. Though how they know he drowned I’m not quite sure. He could have suffered death by torpedo long before water inhalation killed him but there you go. So that was Enric Granados. I will never walk down that street again without remembering him. I guess that’s the idea. Take a look at Wikipedia for a list of other famous Catalans and see who your local street is named after. I am in awe of big Enric’s outstanding facial furniture! Jose Rizal is the national hero of Filipinas (The Philippines). He was imprisoned in the Montjuic Castle for a few days before he was sent back to Manila, where he was executed.